How to care for the surgical site. Specific concerns to look for at the surgical site or in overall health. Initial healing may include some swelling, bruising, irritation or dry eye and discomfort that can be controlled with medication, cold compress and ointment. 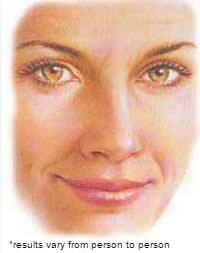 Irritation at the incision sites is also possible. These are all common conditions. Healing of incisions may take 5-10 days at which time any sutures will be removed, if necessary. You will be ready to return to work and normal activity at this time, and to resume wearing contact lenses. Cosmetics can camouflage any bruising or redness that remains. Healing will continue for several weeks as swelling continues to dissipate and incision lines improve. Diligent sun protection and consistent use of darkly tinted sunglasses is essential.